‘And the symbol of Turin Shroud. " It is the theme of the meeting held Thursday, January 8 to 18 in Turin at the cultural center From al-Hikma (via Fiocchetto 15). Speakers Msgr. Giuseppe Ghiberti, president of honor of the Diocesan Commission for the Shroud and Imam Yahya Pallavicini, vice-president of CO.RE.IS. (Islamic Religious Community) Italian, moderates Chiara Ferrero Academy of ISA. The figure of Jesus as seen through the symbol of the Holy Shroud, will be the focus of the dialogue between Msgr. Ghiberti and Imam Pallavicini. "The prospect Islamic and Christian – explain the organizers – the son of the Virgin Mary will be juxtaposed in a comparison that helps to understand what they have in common Christian and Muslim brothers in faith in the one God of Abraham." The meeting is the third round of the series "The Thursday of wisdom" on the theme "Masters of wisdom and holy Islamic ‘, now in its third edition, an initiative born from the collaboration between the old House of Knowledge and the Academy of ISA inter-religious studies, in collaboration with the CO.RE.IS. (Islamic Religious Community) Italian and under the patronage of the District 7. Msgr. Giuseppe Ghiberti: Mail giuseppe.ghiberti@bussola.it . It seems that Monsignor Giuseppe Ghiberti will have to return to the seminary to learn theology and biblical studies instead of wasting his and our time. Your link means nothing, what it states and the ‘why’ can be traced to the evolution of religious ideas in the first centuries AD, so it is something for amateurs to read without the need to go deep into the topic. As for the monsignor, I do think I know more than him, judging by what he is doing, unless that is just PR. I sense you are correct Louis. Thank you, Stan. It is pleasing to see someone get the point, doing away with the need for spoon feeding. Please refrain from personal attacks. Yes, I am talking after a lifetime devoted to studies and also based on personal experience. Stan Walker, MD above got the point, so nothing has been missed. personal attacks?…..you mean like your “amateur” comment?….I did not mean to attack you, but simply stated you missed the point….guess i found your post a bit haughty…if i am wrong i apologize…. “Rick”, I will no longer engage with you and you may have noticed that moderator Dan is eliminating people who post comments like the ones you are posting. Is is haughty to comment after a lifetime of study and personal experience? Theory is one thing, in practice, however, it can be the exact opposite. It is good to find common ground for dialogue, it should be encourage, but how far is it possible? Do you think the Boston bomber facing the jury now is not aware of this common ground? Has he shown any remorse? Kneel and thank God that you were not around to get maimed. If blood was spilling from you body there you would be saying the exact opposite of what you have commented. Well not sure about Dan eliminating me based on what I’ve posted….yes Louis….just because you have a “lifetime” of study and personal experience (notice you’ve used that phrase in both of your postings) does not mean your tone cannot be a bit haughty……remember you made the amateur comment….as well as a comment about spoon feeding…..but I forgive you! Think you made a bad analogy comparing the Boston bomber with nonchristians involved in this “debate” …..that’s quite a reach…you ask, how far is dialogue possible?.. … probably in the 60’s and 70’s people were asking the same thing about the British and the IRA. I am not Neville Chamberlain….I can see this is a dangerous world and we live in. Muslims and Catholics hold Mary in high regard…yes, probably for different reasons, but it’s a start…..I hear some Muslim groups make pilgramages to Catholic Marian shrines for example. Calm down, Rick. We all try to find polite ways of saying things. I slip up often, so I get it. Nonetheless . . .
ok Dan…but not sure “amateur” and “spoon fed” were polite comments…kinda got my Sicilian blood up! As far as the comment upon Monsignor Giuseppe Ghiberti at the opening; thought that was kinda a cheap shot without anything to back it up. I could be wrong about this, maybe he has some bagage I don’t know about. However could someone give me a link or other information or opinion on why this priest is being maligned. The only reason I posted the link at the top was to show how Mary is regarded in the Muslim world. She might be a bridge between faiths. By the way, I wouldn’t talk about Sicilian blood or Neapolitan blood and so on. The people with which you say there should be dialogue have mostly Semitic blood, stronger than Sicilian blood if you know history. We are talking about reducing the shedding of blood in the name of blind monotheism. ha!…you really don’t know Sicilians! The Italian Islamic Religious Community (= Co.Re.Is) is the organization that brings together the largest number of citizens of Italian Muslims. The book “Submission” speaks about a France ruled in 2022 by the Muslim Brotherhood, who manage to go to the government, thanks to a (slightly) incredible alliance with the remains of centrist and left allied to moderate Muslim Mohammed Ben Abbes, leader of “Muslim Brotherhood”, against the excessive power of Marine Le Pen. It is not just another alarm Houellebecq against the progressive Islamization of the country. As written by Emmanuelle Carriere, Houellebecq has the merit of being the only one to talk about a problem that exists but that many intellectuals seem to ignore. Not only for Carriere to Houellebecq is a position politically and sociologically ‘reasonable’. with another religion during a meeting is a bit strange …or worrying…. strange interests about Jesus, the Rozabal, etc.] and Christians find common ground on the Shroud. about the use of a nanoparticle solution made from polymers to connect human tissue. on the self-assembly of polymer systems. can collaborate in order to discover the truth. So, the words by Msgr. Ghiberti should be an interesting point to start toward this direction. and Tradition is a knotty problem. to discuss a Mystery of Faith, this is an useful way for both religious fields. 1 – Boasting is necessary, though it is not profitable; but I will go on to visions and revelations of the Lord. 2 – I know a man in Christ who fourteen years ago — whether in the body I do not know, or out of the body I do not know, God knows — such a man was caught up to the third heaven. The Qur’an is considered “pure revealed literature”. It is believed by the faithful to be “the actual speech of God, through the angel Gabriel, and mediated by the prophet Muhammad” (see sura 53.1–10). Obviously I do not think words of proselytizing will be allowed to next talk of Monsignor Ghiberti. The only difference I had with the good priest, who had a MA in theology and was no fool, was regarding the imprint formation, which he interpreted as a spiritual phenomenon. He had a hard time obtaining funds for the charitable hospital for poor terminal patients he was running, and in such a situation it was obvious that he could not be bothered a lot with a secondary issue. First of all you have to know who is Ghiberti! Why you do not say anything about the Eucharistic miracle of 1453? B.T.W. : I do not believe in the strange ideas by Holger Kersten! Monsignor Ghiberti studied theology, not biblical studies, and don’t forget that theology has necessarily to be based on Scripture. Why have you ignored the “Catholic Herald” link I posted above? Is that because it is inconvenient? 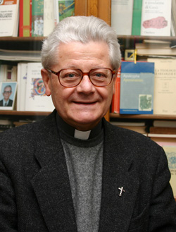 Would you say that the monsignor is brighter than another famous theologian called Benedict XVI, who taught in German universities for forty years, knows how to interpret the New Testament, having written the bestseller “Jesus of Nazareth”, recommended even by top Protestant scholars such as Charlesworth and Evans? The Jospice mattress imprint is not a “strange story” and has nothing to do with cold dyeing. If the dyeing explained the imprinting you would be writing on the process on this blog, challenging what I wrote years ago. Sorry, you prefer not to pick up the gauntlet, dodging the questions is more convenient. Please don’t teach me about “stalking”. I have reviewed books on Freud and lived just twelve blocks away from the house where he died in London, now a museum. I felt the man more than you did. I am not stalking anyone. I had even forgotten about you since you were dodging my queries about the Jospice Mattress Imprint, making claims that you could not substantiate. This morning you said I was “haughty”, trying to get even with me. This is not a professional way of discussion. Do you take me for a fool? Would you call the English priest who wrote the article in the link cited also haughty? The Lanciano host is a different matter. ed. Queriniana, Brescia, 1998. In that book there are some references about previous work by Ghiberti. I am curious to know what is your exact position about Mons. Ghiberti. Am I wrong in my suspect? I underlined the question of the fall of Byzantine Empire (Constatinople). = blood clots and cardiac muscle, carefully sectionalized/dissected…). Please, be more careful in your particular remarks! in parallel to SPM controls). we cannot say more on that strange image. suggesting that I indicated that phenomenon as explanation. this (IHMO) is the right condition about that “Jospice Imprint” enigma. I hope in your answer. But Dante ALighieri wrote an interesting work …. Patres vestri manducaverunt manna in deserto, et mortui sunt. Hic est panis de coelo descendens: si quis ex ipso manducaverit, non morietur. Ego sum panis vivus, qui de cælo descendi. et panis quem ego dabo, caro mea est pro mundi vita. Alleluia. = I am that bread of life. and the bread that I will give is my flesh, which I will give for the life of the world. Please be objective in your comments, avoiding insinuations and personal remarks. Are you trying to hit below the belly? You’ll not get far with this. I am sick, yes, of seeing people posting comments and making claims that they cannot substantiate. I will not change what has been written about the Jospice Mattress Imprint and you have not demonstrated how dye had something to do with the process. As for Monsignor Ghiberti, he can say what he wants, he is the archdiocese’s spokesman. The approach in the form of a dialogue is following what Pope Francis has said, however the ideology must be guided by what Benedict XVI has written (and spoken). So how far will his approach get him? See why the monsignor is wasting his time? Blessed are the peacemakers….monsignor wasting his time?…guess you think St Francis wasted his time as well….